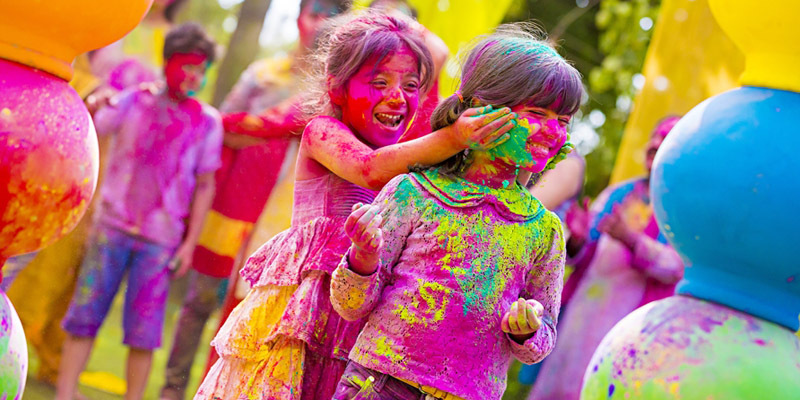 8 Health Tips for a Carefree & Exuberant Holi Celebration Ever! The flamboyant festival of colors of Holi is just a short distance away. So, it’s time to get ready with the water guns, colors, gujiyas, and thandai to have a blast! But, it is also necessary that you take some precautionary measures in order to have a safe and healthy Holi as its better to prevent the consequences rather than facing one! India is a land of vibrant festivities and each one of them is commemorated with their unique ways of celebration. Holi is one such festival celebrated with enthusiasm and exuberance all over the country. What makes this festival unique and cheery is the colorful Gulals, Holi songs, delectable delicacies, and the yummy thandai after a blasting performance on the dance floor. Gulaals implying different meaning are splashed on each other with big bright smiles with some fun Holi-themed music is blared from the speakers. During this time people get so drenched in the joy of the Holi celebrations that they forget about their health as well as of others. The adrenaline rush in the bodies make them forget everything and make them indulge in a fearless Holi celebration ever. So, here we have compiled a list of precautions that you should follow in order to have a safe and healthy celebration of Holi 2019! There are lots of gulal being sold in the market that are formulated using chemicals. When such colors are being applied on the skin, it reduces the quality of the skin making it rough and patchy. At the time of playing Holi, we often ignore the repercussions, but the colors may cause skin infections, irritations, rashes, and other problems. So, it is always best to use herbal or natural colors to play during this Holi. Earlier, when chemical colors were not manufactured, people used to play Holi with flower petals as well as some kitchen ingredients. If you want to have a healthy and safe Holi, then you can do the same. You can use marigold flowers and turmeric powder for yellow color, roses for red color, etc. Before playing Holi outdoors, make sure that you oil your hair or cover your head with a bandana or dupatta. This way your hair will be guarded against the harmful chemical colors that can make your hair frizzy, rough, and damaged. Holi is played outdoors under the sun. So, apply some sunscreen before you go out to protect your skin from dryness and tanning. You must also apply moisturizer to protect your skin against the chemical based colors as it may cause breakouts, eczema, and rashes. After playing Holi with your friends and family, you may be drenched in colors from head to toe. You must not use soaps and other chemicals to remove colors as it may cause a reaction on the skin. Stay safe and use natural ingredients which are more effective in removing colors. You can make a paste of gram flour with curd and rub it on your body to remove colors. During the exuberant festival of Holi, apart from playing with colors, people also munch on yummy festive-themed snacks such as Gujiyas and namkeens. So, you must make sure that these tasty treats are kept away from the colors and you must also touch it after washing hands so that you don’t consume the harmful chemicals present in it. You never know what problems it may arise, so it is better to take preventive measures. Since you will be playing Holi all day out in the sun, chasing people to color them as well as being chased for the same purpose, you must keep yourself hydrated by having a glass of water every hour. You would not want to lose energy and let this put a stop to your Holi party. On Holi, the entire atmosphere is covered in colors. As soon as you go out, you can see color powders being spread in the air. So, you must cover your eyes from these colors. You can wear sunglasses for protection against the chemical colors and if you wear contact lenses, then don’t go out before taking them out as it may also get infected because of the colors. We hope that the above Holi health tips will help you for a safe and healthy Holi. If you want to shop for some herbal colors for Holi, Gujiyas or maybe some Holi Gift Hampers for your close friend and relatives, then visit GiftaLove.com where you will find a wide range exciting gifts for Holi. You can also send Holi gifts to India with so much ease when you choose this website.